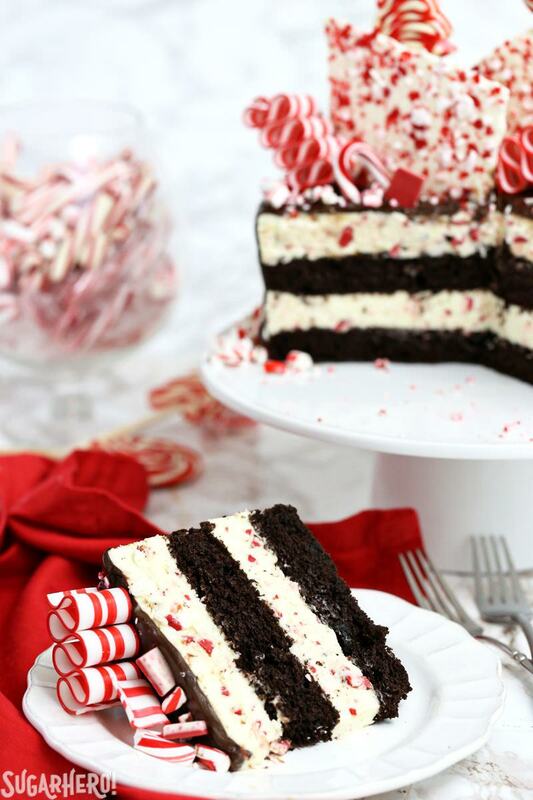 This Candy Cane Mousse Cake is a knockout Christmas dessert! 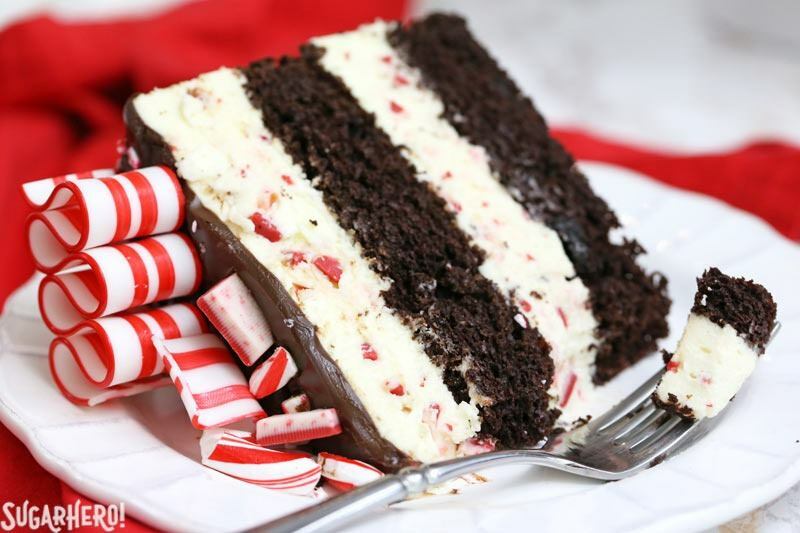 It has alternating layers of moist chocolate cake and candy cane mousse, covered with a shiny chocolate glaze and a spectacular candy cane topping. This is the last dessert I’ll be sharing before Christmas this year, and—at the risk of bragging—I’ve saved the best for last! This cake just hits all of my pleasure spots. Rich, dark chocolate cake? Check! Light and fluffy mousse? Check! Minty flavor that’s refreshing but not too strong? Checkity check check! Subtle, understated decorations? Che—wait, no. You didn’t forget the SugarHero motto, did you? “Go big, and then go bigger.” That’s the SugarHero way! 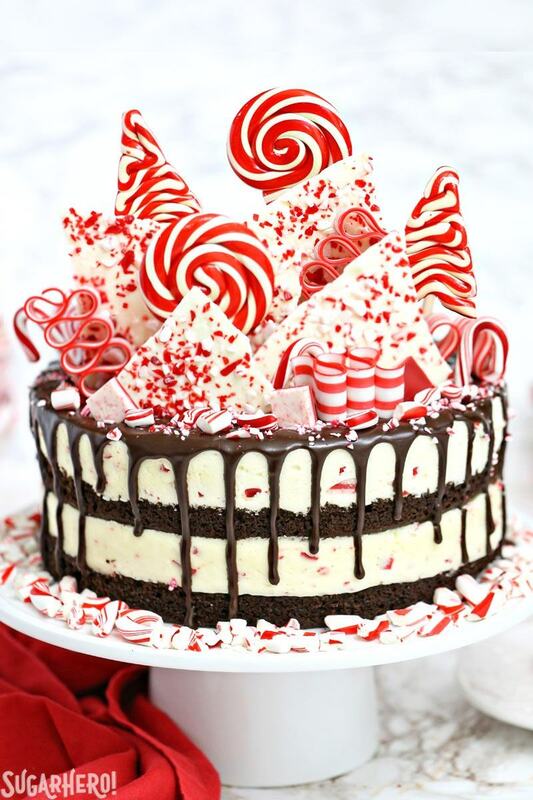 So let’s talk about what’s really going on with this beast of a candy cane cake. This is another cake based on my popular Chocolate Raspberry Mousse Cake. (Earlier this fall, I made a Pumpkin Chocolate Mousse Cake, if you want to see an autumn-themed version as well!) That cake is one of my very favorites, and I’ve decided I’m not going to be happy until I’ve tried new variations of it for every season and every holiday. Repeat with me: Go big, and then go bigger! Should I embroider that on a throw pillow for my house? Asking for a friend. 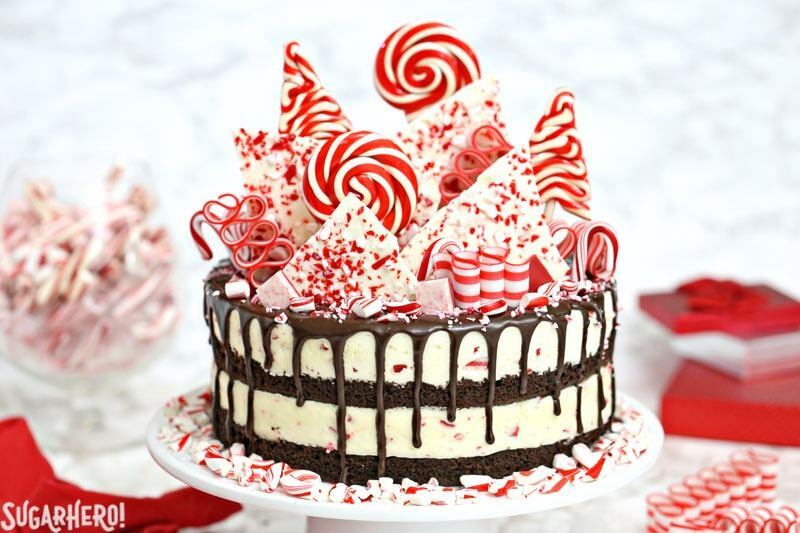 So anyhow, this cake has two layers of my favorite chocolate cake, and two layers of light, fluffy, minty candy cane mousse. It’s white chocolate-based, and it gets its flavor from a bit of mint extract, as well as a bunch of Andes peppermint crunch chips. I used these instead of candy cane bits, because candy cane bits get soft and sticky very quickly. They wouldn’t stand a chance when mixed into the mousse! If you can’t find the peppermint crunch chips, any pieces of chocolate-mint candy will do. As long as you avoid hard mint candies in the mousse, you’ll be fine! So let’s talk about the decorations. After the mousse cake was set, I added a top layer of shiny chocolate ganache dripping down the sides. And on top? A winter candy wonderland, of course! I used every red and white candy cane treat I could find! 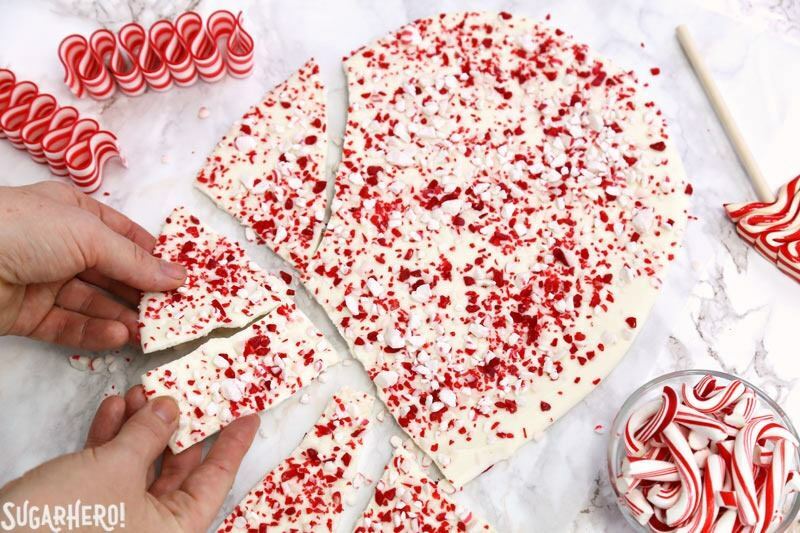 Homemade peppermint bark, lollipops, ribbon candy, mini candy canes, and crushed candy cane pieces all got scattered on the top in a wild display of sugar and stripes. 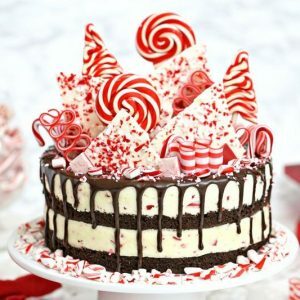 Of course this is optional, and you can keep things as simple as leaving the chocolate ganache plain, or go as crazy as I did and add a whole candy cane forest. 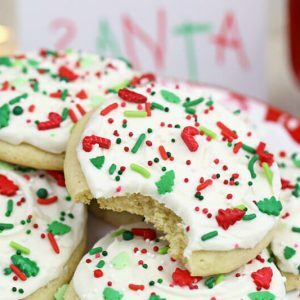 A quick word of warning: everything I said aout candy canes getting sticky still applies to the toppings, so I would recommend not adding all of these decorations until shortly before serving. (I’d give them an hour or two in advance, tops.) You can make the cake and ganache in advance, but as soon as you add that sugar candy, you’ll want to serve the cake soon. If you’d like to see me make this cake, good news! I did a Facebook Live video where I demonstrate the making of this Candy Cane Mousse Cake, and also wear a silly Santa hat. Come for the cake, stay to make fun of me! You can check out the video here, and follow my facebook page for more Live videos! 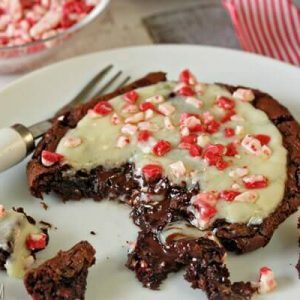 This truly is one of my very favorite holiday desserts, and I hope you’ll give it a try! 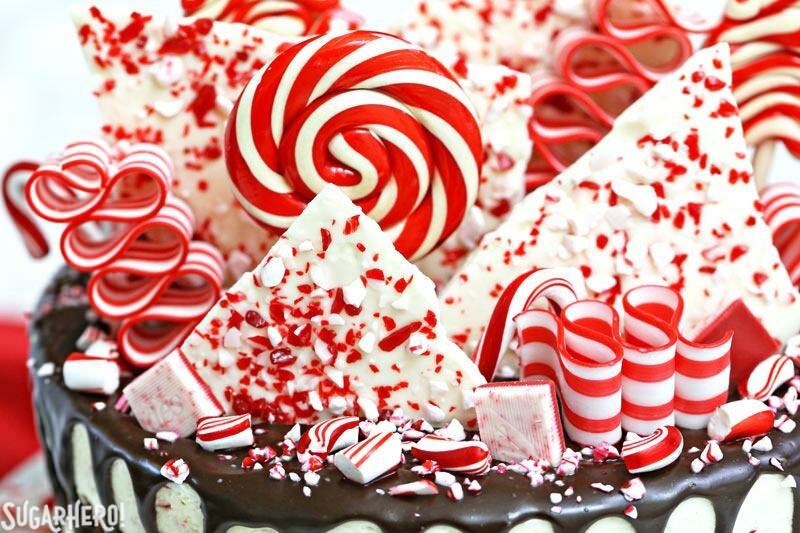 I demonstrated how to make this decadent Candy Cane Mousse Cake LIVE! Find the video here. 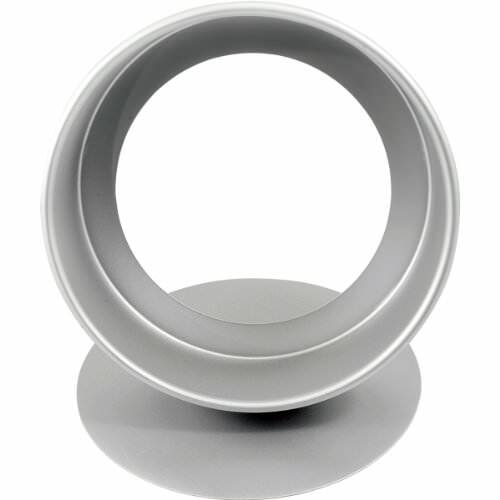 Line two 9-inch cake pan with parchment, but do not spray with nonstick cooking spray. Preheat the oven to 350 F.
When the dry ingredients are nearly incorporated, stop the mixer. Scrape down the bottom and sides of the bowl with a rubber spatula, and finish mixing the cake by hand. Divide the batter between the prepared pans, and smooth it into an even layer. Bake the cakes for 22-25 minutes, until a toothpick inserted into the center comes out with just a few moist crumbs attached. Cool the cakes completely before using. They can be made in advance and kept in the freezer for up to several weeks until ready to use. Prepare your pan. You need a 9-inch pan with sides at least 3 inches tall, and the ability to remove the bottom. Either a cake pan with a removable bottom or a springform pan will work. Line the inner wall with a 4-inch high acetate cake collar or a strip of aluminum foil. Make sure the acetate or waxed paper is long enough so that it overlaps itself, and if you are using foil/waxed paper, make sure you cut the strip tall enough to extend at least an inch over the pan’s sides, since the cake is about 4 inches tall. Place a cake cardboard in the bottom of the pan, then carefully place the baked cake on top of the cardboard. This is optional, but it makes it easy to transfer the cake cleanly and neatly to your serving plate. Prepare the first mousse layer: combine 9 oz (1 ½ cups) white chocolate, 3/4 cup of cream, and ½ tsp salt in a microwave-safe bowl. Microwave in 30-second increments, stirring every 30 seconds, until the chocolate has melted and the mixture is smooth. Pour it into a large bowl, and let it cool to room temperature, stirring occasionally. While you wait for the white chocolate mixture to cool, prepare the gelatin. Whisk together 2 tsp gelatin and 2 TBSP cold water in a small bowl, and set it aside to let the gelatin absorb the water. When the chocolate is at room temperature, microwave the bowl of gelatin for 10-15 seconds, until it is melted. Whisk the melted gelatin and white chocolate mixture together, then whisk in ½ tsp peppermint extract. Whip 1 cup heavy cream to firm peaks. Fold half of the whipped cream into the white chocolate, and once it’s incorporated, gently fold in the remaining whipped cream. 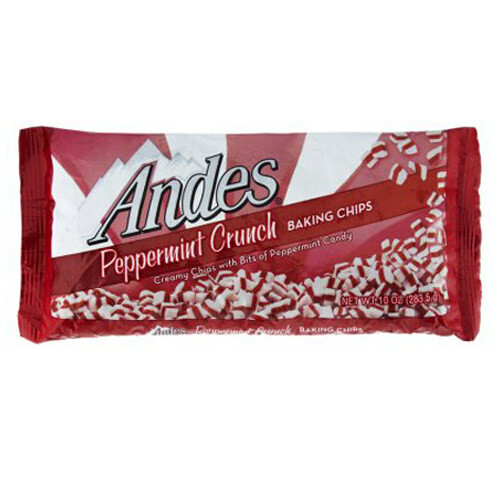 Add 2/3 cup (4 oz) of the Andes peppermint pieces, and gently stir them into the mousse. Scrape the mousse on top of the cake in the pan, and spread it into an even layer. Refrigerate the cake for 15 minutes, until the mousse has just started to set and is firm enough that the cake layer can be added. Gently place the second chocolate cake layer on top of the mousse, then repeat the mousse-making process with the second candy cane mousse layer. Scrape the mousse on top of the cake, and refrigerate for at least 5-6 hours, preferably overnight, until the mousse is very firm and set. To finish the cake, push the bottom out from the pan, or unhinge the sides, and unwrap the acetate strip. Transfer the cake to your serving platter. Make a quick chocolate ganache by putting the chopped chocolate in a small bowl and heating the cream to a simmer. 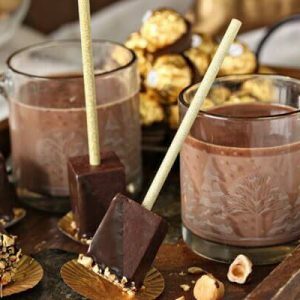 Pour the hot cream over the chopped chocolate and whisk gently until the chocolate melts and you have a smooth, shiny mixture. Pour the ganache over the top of the cake, and use a spatula to nudge it right to the edge and over in evenly spaced drizzles. Don’t worry if the top is not smooth—it will be covered up! 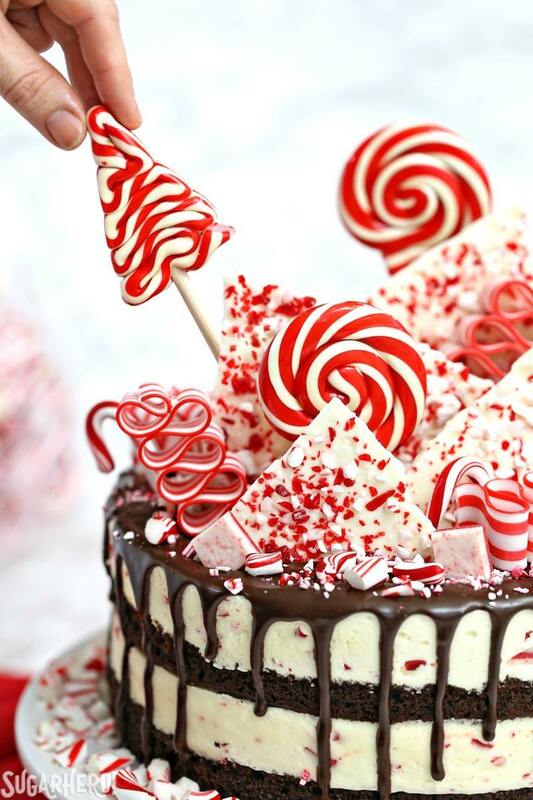 Let the cake sit for 10 minutes so the ganache starts to set, then top it with your candy of your choice—try using different sizes and shapes, like shards of peppermint bark, lollipops, candy canes, and ribbon candy. Sugar candy will get sticky over time, so don’t top the cake more than an hour or two in advance of when you plan to serve it. 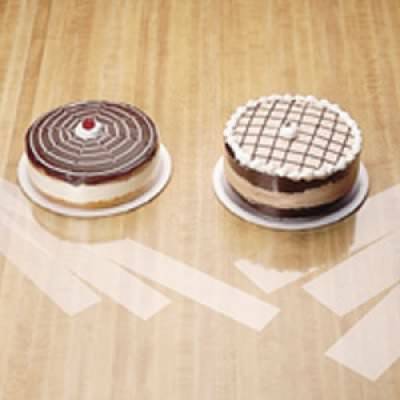 For the cleanest slices, cut the cake when it is well chilled. Use a large sharp knife, and wash it frequently between cuts. For the best taste and texture, allow the cake slices to sit at room temperature for 10-15 minutes before serving. Absolutely beautiful cake! And it sounds more than delicious! This is absolutely beautiful, Elizabeth. Merry Christmas to you and your family. I am in LOVE with this cake! It is absolutely spectacular!!! pinning! I’m about to make this cake because it looks fabulous! However, why do you have us make the mousse twice instead of just all at once? I think you did save the best for last. This cake is awesome, and I’m totally in awe of all of your Christmas creations! Wow,this might just be the prettiest Christmas cake I’ve seen! 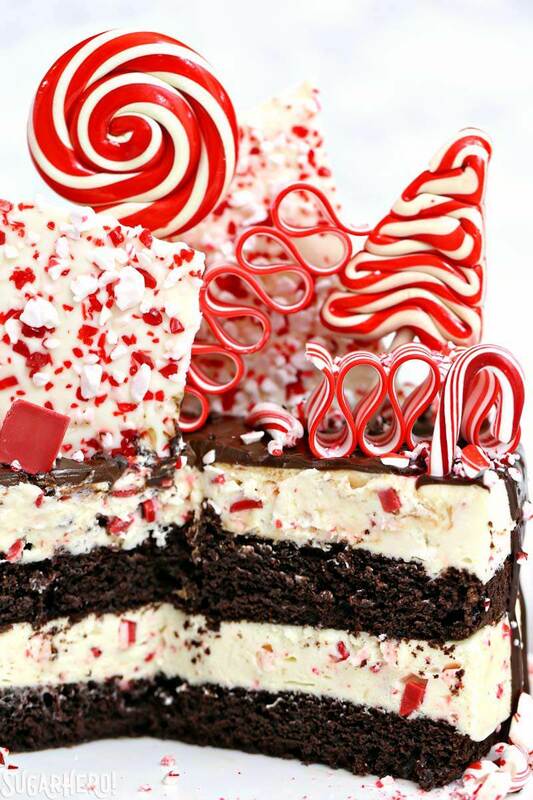 I love all of the peppermint toppings! The top of this cake is BLOWING MY MIND it is so cute and whimsical and cartoonish.